What are important key points for your cabinetry? 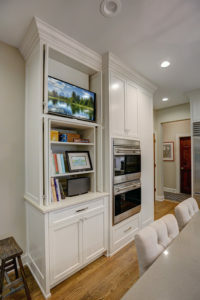 In our last blog, we discussed what are custom cabinets, and the advantages of having your custom cabinets built from a local custom cabinet shop. In this blog, we are also going to discuss how cabinets are made, and perhaps make some comparisons to semi-custom cabinets. In other words, how do our cabinets compare to cabinets that you can order from a box store, or online and have shipped to your home? When discussing the construction of cabinetry, they tend to discuss what materials cabinets made of. In most cases, cabinets are either made of MDF or Plywood. You have probably read or heard an argument where MDF is better than plywood and vice versa. In my opinion, what the cabinets are made of is not as important as how thick the sides, bottom, and backs are. Our custom cabinets have ¾” sides, bottom and back. Why is this important? Cabinets are expensive, and they need to be durable, and have longevity. The thicker the material the more likely your cabinets will survive the daily use, stay strong and square. Drawers are another very important item, if not the most important part of any cabinetry. Drawers are used multiple times a day and, get the most abuse. All of our drawers are made of 5/8” thick, solid Maple, and Dovetailed. Solid Maple along with Dovetail construction not only looks beautiful, it will hold up for many years. Drawers seem to be the one item that is most often overlooked when comparing cabinet prices. Other low-quality drawers will be made with other materials and stapled together. The strength of the drawer comes from the solid wood and Dovetails joints combined. Full overlay doors and drawers provide a seamless look with less gaps between them, roughly 1/8” between doors and drawers. Full overlay also allows for a frameless build cabinet. Frameless cabinets allow up to 40% more cabinet space inside your cabinets. If the cabinets are built with quality material and construction, a frame is not needed. Why waste the space? Hardware for your cabinets is the piece that brings it all together. Let’s start with the hinges. All our hinges are Blum soft- close, and adjustable up to a minimum of six different ways. In-out, up-down, and left-right. Cabinets will naturally move over time and using this hardware will allow them to be adjusted. Drawer hardware glides are Blum undermount, full extension, self-closing, and adjustable in 4 ways. Full extension will give you complete access to the entire drawer. Ball bearings and steel glides provide smooth operation, and will last for many years. Other glides will be side mounted, will not be fully open, and are never soft close. 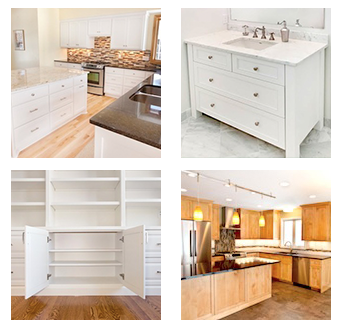 If you are thinking about new cabinets for your MN kitchen, bathroom, laundry room, or even the library we can design, and build your cabinetry to fit your needs, give Artisan Cabinet Company a call at 612.235.4873. If you got blog ideas for Artisan Cabinet Company, e-mail trent@artisancabinetco.com. We service the Minneapolis / St Paul Twin Cities Metro Area.